Disclaimer: I received a pair of Under Armour HOVR Sonic to review as part of being a BibRave Pro. Learn more about becoming a BibRave Pro (ambassador), and check out BibRave.com to review find and write race reviews. Anyone who knows me, has probably heard me talk about my right foot blisters. Seriously, every time I run more than three miles, I get a blister over the old blister. If I run five miles, I will get a really good blister, usually filled with blood. If I run a half marathon, I will get two rather large blisters. By mid-August, my right pointer toenail will be dead. I have tried different brands and sizes of shoes. In fact, prior to testing the UA HOVR Sonic shoe, I was wearing men's shoes because of the larger toe box. I have coated my feet in different body glides. I have even used corn starch! Then I tested the women's UA HOVR Sonic shoe. The shoe offers a soft knit lace-up area, which allows for a snug fit throughout the foot and a compression-like feel. The shoe is lightweight and is very breathable. I started off my testing with small miles. I ran a hot two miles around Michigan State University campus. So far, so good. No blister, which did not really surprise me as I only ran a couple of miles. The real test would be a five mile or half marathon run. I tried the shoes for a four mile run the very next day. Everything was good. No new pains and no new blisters! Then I ran with them for a few more runs (three, four, five and eight miles at a time). Still feeling good and starting to get used to the lightweight neutral supportive shoe. Then I ran a half marathon and I still do not have any new blisters! My feet and legs are still feeling good. Can it really be? Can it be that I have finally found the shoe? The UA HOVR Sonic shoe is the only shoe that has not given me blisters! I am ready to declare, now that I have made the official switch! The shoe really does make the difference and for me, I'm sticking with UA HOVR Sonic! Things to look forward to: Some UA HOVR Sonic shoes are equipped with UA’s Record Sensor™ and will pair to your phone. Read: Shoes will sync with a running app. Disclaimer: I received Shady Rays Sunglasses to review as part of being a BibRave Pro. Learn more about becoming a BibRave Pro (ambassador), and check out BibRave.com to review find and write race reviews. It is summer and the sun has finally come out! When I had the opportunity to test Shady Rays sunglasses, I immediately took it as I am a big fan of UV protection. The glasses are fashionable and offer a snug fit, perfect for use while running. 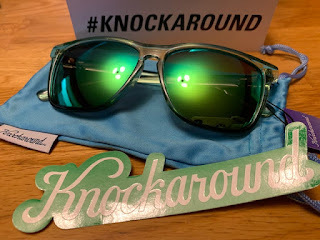 I chose the Signature Series Emerald Ice Polarized as the frames are clear and the polarized lenses are green and blue. The glasses stayed put, during my short and longer runs. I wore these glasses with a hat and with my AfterShokz Trekz Air and they fit perfectly. I wore them for work and for play. They even stayed on while boating! The glasses were a huge hit with the spouse who made a habit out of "borrowing" them, especially since they match most of his outfits. They felt snug around the ears but did not cause a headache. One caution, however, is that if you are in the habit of pushing your glasses on top of your head or wearing them on your hat, when the sun is hiding, they will likely slide off. The good news, however, is that Shady Rays offers lost and broken replacements! Shady Rays has a mission to fight hunger in America, which has led to over one million meals provided to date. In fact, eleven meals are provided as a result of each order through Feeding America.